San Francisco Supervisor Aaron Peskin, who says he was having dinner nearby and was at the scene of the fire within minutes of it starting, said the fire department was painfully slow in responding. Now, he’s calling for San Francisco Fire Department Chief Joanne Hayes-White to resign. Sergio Quintana reports. San Francisco firefighters battled a four-alarm fire in the North Beach neighborhood Saturday night. Officials said there were no reported civilian injuries but as many as 15 people were at one time displaced after firefighters evacuated the entire block of Union Street since the fire was first reported around 7:24 p.m. One firefighter still working at the scene on Sunday was injured, but he is said to be stable, according to fire officials. RAW: SF Firefighters Battle Four-Alarm Fire that Sparked in North Beach Neighborhood. 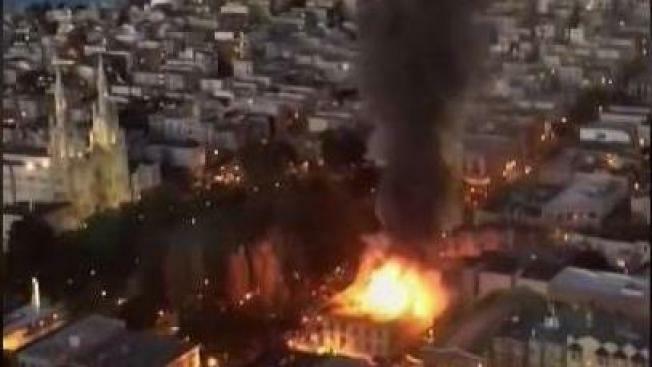 San Francisco firefighters are battling a three-alarm fire in the North Beach neighborhood Saturday night. The fire, which sparked at 659 Union Street, affected a vacant second-floor residential area and five ground floor commercial businesses. Firefighters quickly arrived at the scene within two minutes and had water on the fire within six minutes, according to San Francisco Fire Chief Joanne Hayes-White. It was then reported to be a two-alarm fire, which quickly changed from three to four-alarms shortly after 8 p.m. The fire was pronounced under control just after 1 a.m. on Sunday. According to fire officials, the battle quickly changed from "offensive mode" to "defensive mode" after officials found no life safety concerns. 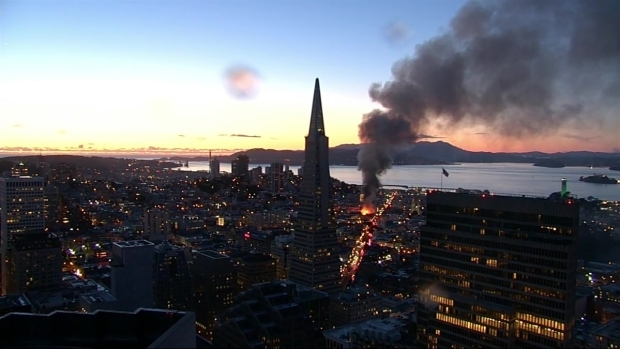 San Francisco firefighters are battling a four-alarm fire in the North Beach neighborhood Saturday night. The cause of the fire is still unknown and according to Hayes-White, officials won't know until Sunday when the fire has cleared and they obtain more evidence. As of Sunday morning, eight people were still displaced as a result of the blaze. For those displaced, officials said the evacuation center is located at the Salvation Army building at 1450 Powell St. and is operated by the Red Cross. 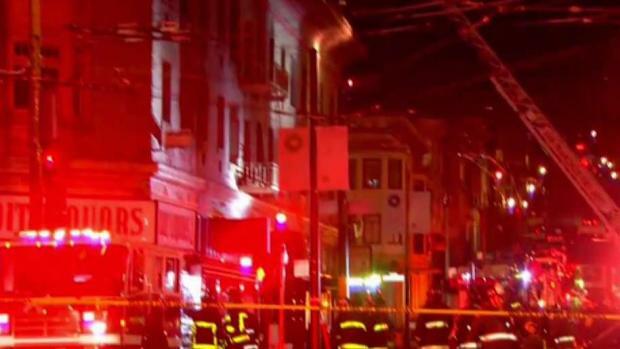 San Francisco firefighters battled a four-alarm fire in the North Beach neighborhood Saturday night leaving many witnesses in the area stunnned. Roz Plater reports. Due to the number of people making it difficult for officials to do their work, Columbus at Broadway was shut down. Officials asked residents to avoid the area.